Nearly half a million pounds of lottery funding has been allocated to a UK version of an innovation, popular in Australia, which helps men spend time together and talk. No, not a pub. The Big Lottery Fund (BIG) has allocated 39 grants totalling £7.3 million including £493,138 to Age Concern Cheshire for its 'Men in Sheds' project following a successful pilot scheme in Northwich. The programme is aimed at supporting men over the age of 50 who have been affected by life-changing events such as bereavement and redundancy and provides an opportunity to socialise and learn practical skills from each other in a supportive environment. 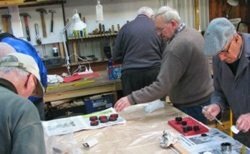 Sanjay Dighe, chair of the BIG England Committee, called Men in Sheds ‘a great example’ of the community-based schemes the organisation seeks to support. The scheme is partnered with a similar one in Australia where an extensive network already established. Indeed, in May, Australia’s men’s health policy was launched by prime minister Kevin Rudd in a shed in Melbourne. 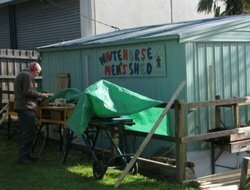 The funding package Rudd announced included $3 million for the Australian Men's Sheds Association. Ken Clemens went on: ‘this sort of informal male environment has been able to appeal to older men, especially to those who had not previously engaged with services or with voluntary sector agencies. Other organisations set to receive BIG grants include the Samantha Dickson Brain Tumour Trust, North Dorset Age Concern and Marie Curie Cancer Care. Submitted by Visitor on 13 October 2011 - 10:19pm. Submitted by Visitor on 13 October 2011 - 10:17pm. Submitted by Visitor on 20 February 2011 - 5:14pm. Is there any chance of a Shed opening in the Oxford area?